5 Questions for…Sanjay Desai, M.D. Thoughts about the important role of point-of-care technology in today’s medical training. Q: What’s been the most significant change in training from the time you were an intern and resident? A: The idea of actual books and libraries is antiquated. The current trainees expect to have information for them immediately available electronically. This is great progress because we can teach concepts and not force them to memorize formulas and data. The formulas and data are now a tap or two away. This is a much better way to learn and practice medicine. Q: Is the current method of training interns and residents still effective? A: The actual care of patients will always be the center of medical training. There is no replacement for this. However, with all of the operational changes in the practice of medicine, our trainees have less time to read and learn. This is why it is essential to have easily accessible information. Q: What’s the greatest challenge for these early-career physicians and other clinicians who care for adults in a hospital setting? A: The greatest challenge is maintaining your humanism amongst the ever-growing pressures on your time. There are endless electronic medical record obligations, increasing administrative requirements related to documentation and billing, and a shifting interface from the bedside to the team room. These together are reducing the joy in medicine and need to be addressed. Q: What has been the impact of electronic decision support tools on the training of early-career clinicians, on their mentors, and especially on patient care? A: In academic settings, these decision support tools likely play a smaller role than in other settings, but nonetheless are increasing in value. They allow physicians to adhere to best practices. They also teach us how to deliver cost-conscious, high-quality care. Q: What should be an intern or resident’s criteria for relying on a decision-support app? A: This is really driven by the program or hospital and is less left to the discretion of the trainee. 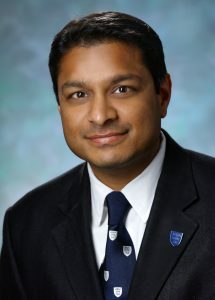 Dr. Desai is the director of Johns Hopkins Residency Program, and its Osler Medicine Survival Guide is a great example of how new technology is changing how young clinicians are learning to tend to and treat patients. It was first written in 1994 by senior medical residents of the Osler Residency Training Program, who wanted to pass on what they had been learning and practicing to the next cohorts of house staff. The Guide has been updated annually by the medical residents of the Johns Hopkins Residency Program for more than 20 years, with each topic validated by a clinical expert. And the user base has grown to include nurse practitioners, physician assistants and medical students throughout Johns Hopkins as well as at hospitals across the United States and abroad. Learn more about the Osler Medicine Survival Guide.